"Cape Cod: Illustrated Edition of the American Classic"
A Harvard Museum of Natural History traveling exhibition featuring fine art photographs from the book together with coordinating interpretive materials. Great for all ages! The August issue of D Magazine contains a six page story featuring photographs from the book. 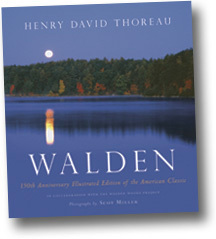 Partial proceeds from "Walden: 150th Anniversary Illustrated Edition" benefit the Walden Woods Project. Read media stories about the book, listen to radio interviews, and more.